gosh darn it, it is just so freaking easy. there are many people in this world of ours that complain about tofu, and how it is lacking flavor, and that it is too soft, and that it is weird and unnatural. and my response to these people is that, like most flora and fauna in this world, you are afraid of that which you do not understand. tofu can be a magical canvas to put all sorts of flavors upon. the trick is to drain it. tofu has an amazingly high percentage of water, and it is precisely this water that causes it to lose texture and flavor. no water, no problem. remove your tofu from its package and drain the water. wrap it up nice and tight in a few layers of paper towels, set it on a plate with a cutting board on top, and place something heavy on top of the whole shebang. use an unoccupied cutting board to mince some garlic and peeled ginger. 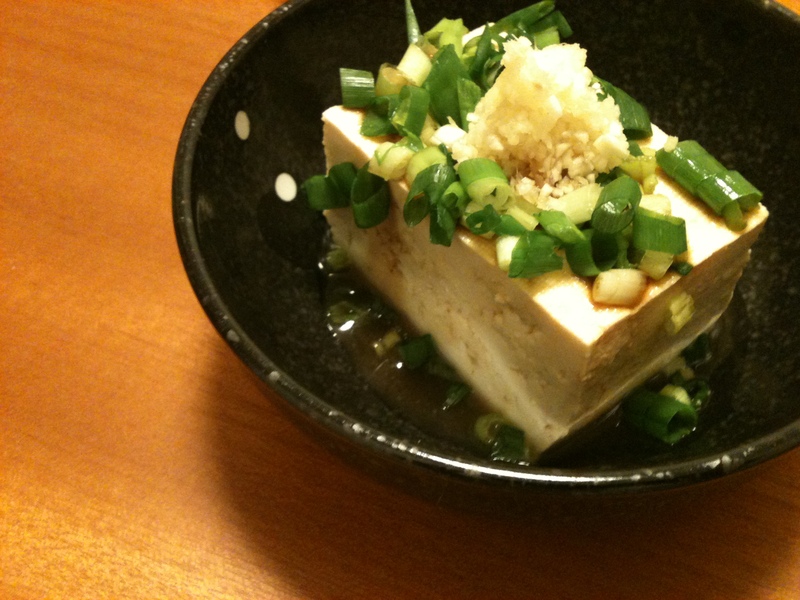 the idea is to use these two aromatic minces to offset the mild creaminess of the tofu. chop some green onions super fine. the trick to this is to cut off the base of the green onion, and fold the bundle into three or four. each stroke of the knife will cut four uniform tiny disks. unwrap your tofu and toss the paper towels. set the tofu in a bowl with a high rim, top with a nicely packed pinch of your minced garlic and ginger, and then give it a quick splash of soy sauce. finally, sprinkle a handful of the green onions on top. oh, you know it. one of my other recipes for hiyayakko i’ve started to love lately is a dressing made from doubanjian, sesame oil, sugar, a little soy sauce, and black pepper. also awesome on cucumbers. and by the way, katsuobushi is truly an incredible garnish. on okonomiyaki? oh my gosh. indispensable. That sounds awesome. Makes me think I should try making a Korean-y hiyayakko with kochujang! Katsuobushi waving around on hot agedashi-doufu or okonomiyaki always used to make me wish I could take animated photos (back before those existed…).